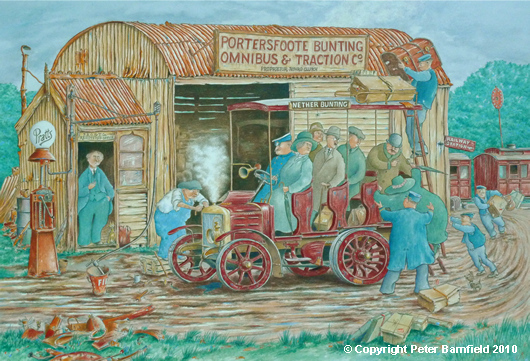 The Portersfoote Bunting Omnibus & Traction Co. established its headquarters in a corner of the station yard at Portersfoote Bunting. The railway company, although not keen to foster road transport in the area in case it competed with trains, thought it could keep an eye on the interloper in this way as well as collect some rent and maybe passengers too. The railway never reached Nether Bunting, which was only served by a ferry. After this ceased to run the bus company began a regular service between Portersfoote and Nether Bunting. Great Bunting, however, remained aloof and continued to be served only by the trains, since these early motor vehicles were quite unable to negotiate the steep hill up to that village with more than one passenger and a small suitcase.